Hi, I am interested in your 1957 Ford Thunderbird (stock #1237) listed on Autotrader for $34,950. I'd like to get more information about this vehicle and confirm its availability. When GIs who fought in the European Theater of World War II returned home, they brought with them fond memories of the British two-seaters that were a common sight over there. Some even managed to buy some and have them shipped home. It was clear to Detroit that there just might be a market for an American made version of the famed two-seater open car. The two most famous of these were the MG-TC (and the later TD) and the incredibly handsome Jaguar XK-120. Kaiser introduced the famed Kaiser-Darrin in the early 50s and Chevrolet would follow next with the legendary Corvette. Ford was not blind to Chevrolets new car, but chose to develop a car along a different path. 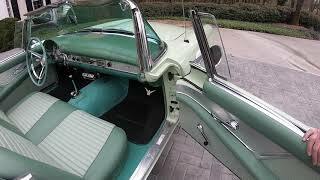 It was decided their car would be made of metal instead of fiberglass; that it would be powered by a V-8 engine unlike the Corvettes Blue Flame Six ; and that it would feature roll-down windows and an optional hardtop unlike the Corvettes snap on curtains. They further decided that it would, as much as possible, utilize the same tooling and parts interchangeability with the big Fords of that era. This Example is finished in Extremely Rare Willow Green, Code J , with Beautiful (2) Tone Green Interior, & Willow Green Hard Top. This Rare Estate Classic Underwent a restoration, including Exterior, Interior, Top, Brightwork, and More.